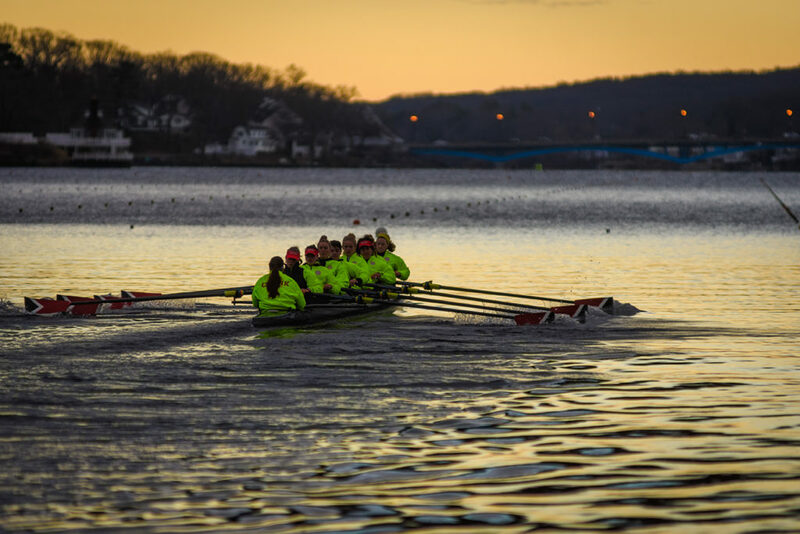 The Clark crew team practices at sunrise on Lake Quinsigamond. Emily Ladda ’19 is a Clark student-athlete who has managed to find the balance between matters of the body and mind. 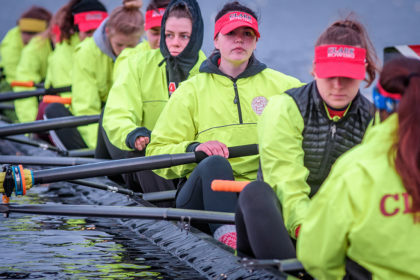 A four-year member and current captain of the women’s varsity crew team, Ladda adheres to a demanding schedule of early-morning practices and individual workouts to prepare for grueling crew regattas. But that’s just the “athlete” part of her experience. Emily Ladda (center, in visor) on Lake Quinsigamond with the Clark rowing team. As a student, Ladda, a Presidential LEEP Scholar, majors in biochemistry and molecular biology with a minor in public health; she conducts research in the lab of Donald Spratt, assistant professor of chemistry and biochemistry, and is writing her honors thesis. On top of all that, Ladda serves on the Student Athletic Advisory Committee, is a Big Sister at the Big Brothers Big Sisters of Central Mass, works as a facilitator with the One Love initiative, and was a peer reviewer for Clark’s Scholarly Undergraduate Research Journal. She has learned how to be efficient with her time — out of necessity. Her passion for science started in high school. “When I was taking AP Biology and we were learning about enzymes, I knew without a doubt that I wanted to study biochemistry and molecular biology,” she says. Emily Ladda conducts research in Professor Donald Spratt’s lab. As a sophomore, Ladda did research work in the lab of Justin Thackeray, professor of biology, which led to a summer research internship at the University of Connecticut’s Health Department of Genetics and Genome Sciences. 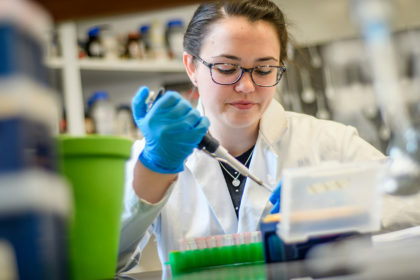 That project exposed her to the study of protein chemistry, which is the focus of her work in the Spratt lab, where she aims to decipher the unique mechanisms of the HECT ubiquitin ligase family of enzymes that control numerous cellular processes. With her undergraduate career coming to an end, Ladda is planning to pursue her master’s degree through Clark’s Accelerated B.A./Master’s Program in biochemistry and molecular biology before applying to medical school. She will continue her protein research, characterizing the structure and function of AREL1, a protein involved in cell death. It’s a lot to tackle, but four years of balancing the rigors of athletics and academics have shown that Ladda is always in the game.